Our two-day, hands-on training courses are tailored around you so you can take the most out of our class. We make sure that our certified licensed cosmetologists receive the highest education and quality in the art of eyelash extensions. Our lash professors will fully equip each student with the knowledge and products to launch their new exciting career. We make sure you have a more intimate setting which in turn gives you more time with the instructor. Our courses cover all aspects to become a successful lash artist including: lash anatomy, health and sanitation guidelines, eyelash application and aftercare practices. 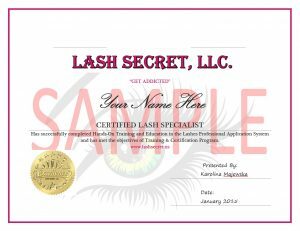 ** must be certified in classic lashes or have a thorough understanding of classic lashing.